→Amazon customer service – It doesn’t get better than this! Amazon customer service – It doesn’t get better than this! I’ve just experienced what might be the best customer service in my life! It is definitely the best so far. The story goes like this. Eyeing an eReader for a long time, I had ordered a Kindle back in November. Since I one of my friends was travelling to India from the US, I got my Kindle delivered in the US. Once I laid my hands on it, it was definitely one of the most prized gadget I ever owned (yes, there are emotions involved). The Kindle worked flawlessly for a couple of months and I kept reading on and on until that day! Yes, I was travelling to Riyadh and had put my Kindle inside my bag. When I took it out, I saw my screen frozen with some horizontal and vertical lines on it. That was it. My Kindle was broken. And my heart as well. I was in such a state of shock that I didn’t even bother to contact the customer care to get it repaired. Since the Kindle was damaged because of possible baggage mishandling, there was no way I could dream of a warranty claim. Amazon offered me to *replace* my Kindle free of cost under warranty. Amazon agreed to bear the custom clearance formalities, custom duties etc. As if the above was not enough, Amazon agreed to pay for the shipping charges incurred to ship my defective Kindle back to the US. I have no words to appreciate this gesture. Kindle is by the the best eReader out there. I might have purchased a new one even if Amazon did not offer a free replacement. But they did. And I am a customer for life! I have my new Kindle already with me. Amazon has not just replaced a piece of hardware. It has given back a lot more which I can’t even explain. Now, that really amazed me!!!!!!!!! I accidentally wiped my kindle fire hd 7 including OS, now kindle is stuck in orange bootloop. meanwhile I tried few tools like kindle fire utiltiy, SRT, KFhd but of no use ,, how can you help me in this regard? Sorry to know that you are having that problem with your kindle well you could bring it to us we are specialising in all hardware and software problems for complete range of Kindle products . Congrats to you. But I ve faced exactly the reverse. 1st they dont ve any service centre. there is no authorised centre as well. these people have declared my kindle as dead and put up a sorry face, saying they cannt help it. I think, everyone, within warrantnty period will treat u that way, post that it will treat you like this. BTW between ipad vs kindle, wht u suggest? I know the big difference in price..but do extra features worth the diff. or Kindle is gud enuf? Well Kindle is purely meant for reading books. Nothing more. And it is the best at it. iPad offers much more and is definitely worth the price. I wonder when will the Reliance’s and Tata’s of this part of the world will delight us with this sort of customer service! @Sumit: Callup @ 1-877-453-4512 or 1-206-922-0844. There should be a quick resolution to your problem. Thanx amit……….. i have contacted them and they are sending me a new one at my address without any shipment charges. Amazon, indeed provides best customer care service in the world. could i get in touch with you personally as i seem to be facing the same problem. Which customer care did you contact, and what all queries were asked regarding the same. Hoping eagerly for a reply. @Sanjay: Call-up @ 1-877-453-4512 or 1-206-922-0844. I’ve also dropped you a note. What if my kindle is out of warranty. Any idea about how much they will charge. Manvendra, call them up. To your amazement, they might replace it even beyond warranty. Just try! i faced exactly same problem just now had conversation with customer support team . They told me that they will replace the kindle and had sent the mail . They asked me to updated my credit card details and said they will charge the amount for new kindle and refund the amount back . i have a query how can i contact you ? my kindle ius frozen !! and it doesnt work ..i m highly taken aback by the kindle services !! and the indian number i cannot call !! i am not able to contact them anyhow !! kindly help me contact them soon..i have got so many books from the kindle store and all of them seem to be wasted..pls pls help me soon..
Callup @ 1-877-453-4512 or 1-206-922-0844. Amazon team will guide you. There’s no India service center. I have the exact same experience – bought Kindle during my trip to the US last month and now its frozen and dead. I just spoke with an extremely unhelpful csr at amazon who says shipping to and from will be done only for a US address since it was originally shipped to the US. Am following up with them over email referring to yours and other folks’ positive experiences. Am hoping it gets resolved – will keep you and others here posted on how it goes. I have been an amazon customer for 13 years now in the US, and a Zappos delighted customer for 7 + years. My thought earlier was that Amazon hopefully learnt a thing or two about customer service after acquiring Zappos, but still quite some ways to go I suppose. Thanks for sharing. Would request the couple of folks above to come back and give an update on how their experience was so that we can have more evidence when speaking with amazon on this. Thanks for the comment. It does sound like Amazon may have updated the policies. The replacement is shipped to a US address. Let’s hope your manage to get a replacement here! I was going to buy Imported Kindle from ebay.in. But by reading RSV update I am bit confused now. Can someone please update if they have any issue in 2012 and customer service. Kindle is now available at Chroma stores in India. You could buy from there. hi i have a kindle fire all of a sudden it hung and when i push the power button to put it on it opens up to some team recovery project . what should i do !! I guess you should immediately contact customer care. You, my friend, are truly the exception to customer service by Amazon.com. In the past 2 weeks, 4 different people told me 4 different things. They even used the word “guarantee” my gift card issue to be deposited. To date, no change. To date, they are sending me emails that go against every conversation we had. Luckily, I save copies of all of the conversations. Bottom line is that Amazon will only do what they want-there is no concern for the customer here. They say wait 2 weeks, but after you show them the facts, they say 24-48 hours. Then they send you an email saying 2 weeks. So you wait. All of that time wasted and all promises broken. I am done with Amazon. As a buyer and a seller. Your purchase history on kindle store might have contributed for the replacement. But still it’s cool. hmmm…not really. Actually when I got it replaced, the purchase was 0 :). But I understand that now the replacements are limited to the country where you purchased. Or maybe, I was really lucky! the kindle although we charged it completely. Presently we are stayed at south delhi r k puram, new delhi. kindly advice us nearest center for repairing. I bought kindle dx from homeshop18 on 20 oct, 2012. They shipped it from US. Today due to an unfortunate event of accidental exposure of pressure by hand, my Kindle Dx 3G 9.7″ screen got cracked at a point and slowly the ink has spread all over. I called up Homeshop customer care, they had no clue, so they said they will call me back tomorrow with information about options related to screen replacement. I looked up in google, ebay and few other are providing Dx 9″ screen at 100$ approx cost, even if i am left with no option other than buying a new screen, how do i get it fitted on my kindle device? Any help? thanks in advance. Haven’t been able to keep-up with the responses lately! I hope you somehow managed to get the replacement. Hi Harpreet, I believe you can walk into any of the Croma stores as they’ve started selling Kindles in India officially. I am not sure, but logically they should provide you with the service. I believe the best way is to call Amazon customer care center once. I think they have changed their policies now (I was lucky to get a replacement easily). However, it is worth calling them once. Alternatively, you may visit one of the Chroma stores and see if they can help. Though they may charge. Hello. 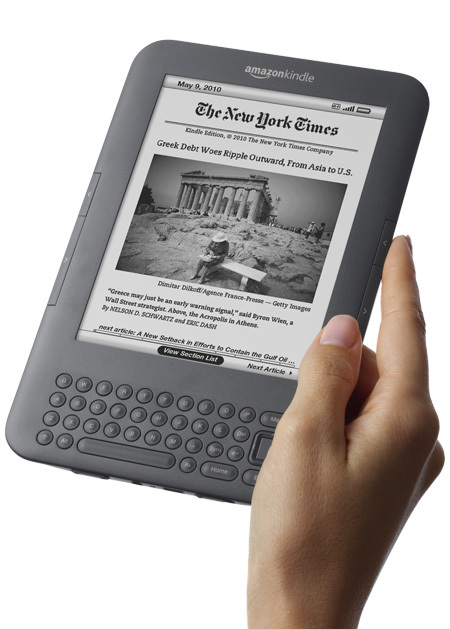 I bought my Kindle from Oman and currently I am in Delhi, India. I have the same problem as yours. The screen got damaged, maybe due to the device being in bag for a long time. What am I supposed to do? My Kindle 3 the LCD screen got damaged my son accidently placed his hand and pressed. I accidently left the kindle on the bed. I am located in Kerala India. Kindly help me out. Landed on your page thru’ a Google search… not sure if the thread is still active. Would anyone know someone who repairs a Kindle device in Mumbai. I have a Kindle 3rd Gen and screen has gone bad. Amazon provide the best customare care services and the delivery the product quickly. Great story of customer service, kudos to Amazon ! I have my son’s Amazon Kindle, not being used for years. I intend to use it by uploading Books from Amazon kindle editions.I am also registered with Amazon and procured books and other products a number of times from Amazon in the past . But I find it is not responding even charging it for quite some time. For the joy of reading! Did you enjoy reading my blog? Subscribe to get updates when I post a new article. Amit has read 1 book toward his goal of 12 books. Did you enjoy reading? Subscribe to get notified when I publish a new article.